I guess by now you know that our annual expedition to Ladakh in a fleet of Audis is something all of us at OVERDRIVE look forward to. Every year, we meet a new bunch of readers and automotive enthusiasts. And together we spend 10 days in hard country, in unspoilt country, taking in the sights, learning from each other and so much more. 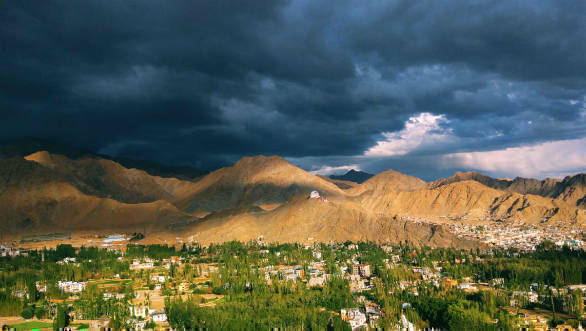 The backdrop is of course, Ladakh, the land of high passes that is now the ultimate ride of every biker worth his salt. 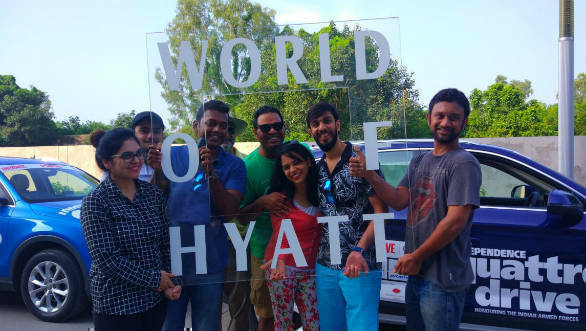 This year we started from the superbly located and extraordinarily hospitable Hyatt Regency in Chandigarh. 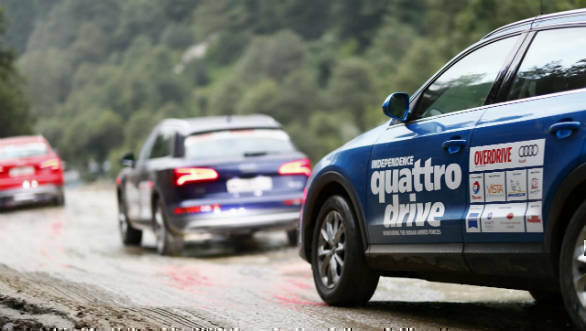 Our Audis, two Q3s and two Q5s, one petrol and one diesel each, plus the Q7 received their new Michelin tyres and Total Quartz Engine Oil in the process of preparing them for the journey that lay ahead. But we had more goodies to try this year too. Zeiss Vision Care India, the maker of extremely high quality lenses, wanted us and all participants to try out their DriveSafe lenses. These lenses offer the legendary Zeiss optical quality with a special coating tha cuts glare - good for low visibility and night driving. And Vista Car Care gave each car a care hamper which included car perfume, a anti fog spray and more. 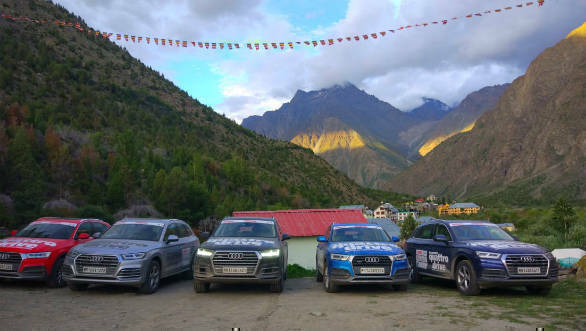 But what we were looking forward to using in our traditional Clean The Car Battle in Leh, was their new DryKleen, a water-free car clean up system. A spray bottle and two pieces of microfibre cloth to take on Ladakh's famously sticky-stainy dust? This'd better be good, no? Our destination was the impeccable The Grand Dragon in Leh. We could just sing praises of its powerful hot showers at the end of the long high-altitude drives, but that would be overlooking the comfy rooms, and the delicious food on offer. 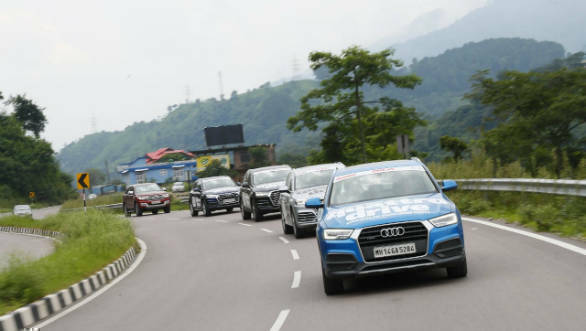 As our quintet of Audis rolled out of Chandigarh, it was pretty clear that a bright, sunny drive this was not going to be. But we made excellent time to Manali thanks to a group of excellent drivers from the OVERDRIVE reader community. It made us more excited to leave Manali for the run to Jispa. 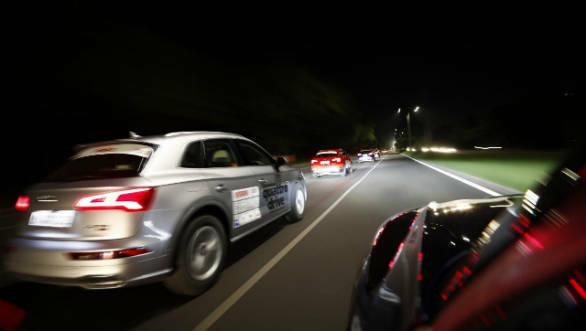 The Audis were running smoothly and people were settling into them, using the DriveSelect to find their comfort zones. Rohtang, of course, is far more empty than it used to be thanks to the NGT's ban on tourist traffic on top. But on the day, it was shrouded in fog so thick, you could barely make out the Independence Quattro Drive 2018 logo on the bonnets. In the lead car, an OVERDRIVE navigator seemed to be able to see notably farther than the others. And when the glasses he was wearing were exchanged with the driver, Pradeep Prakash from Bangalore, the driver could see but the navigator was blinded. Do the Zeiss lenses work? Oh very yes. They added a few feet of visibility and their slightly warmer tone both made what should have been a very slow climb a fairly swift one. On the other side, was Kamring Dhaba, or Sharmajis famous for its meat rice. The fog had given way to a blinding sun and it was nice to sit outside before heading up the valley to Jispa, our stop for the night. 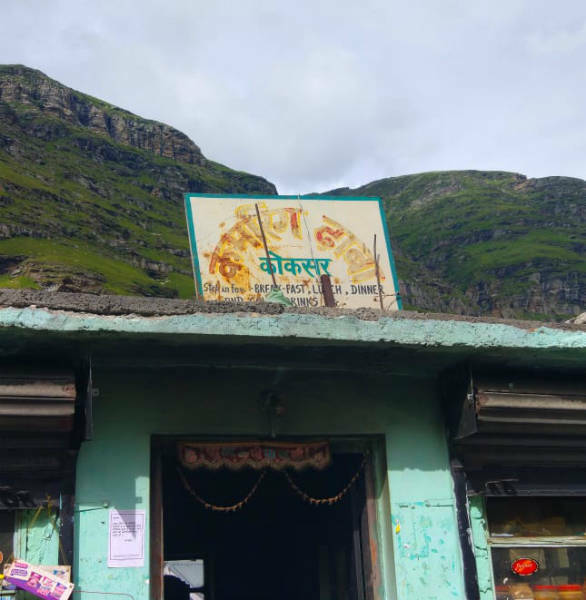 Jispa is getting more and more commercialised and the opening of the Rohtang Tunnel, said to be two years away, has clearly woken up this sleepy, green valley. But even today, there's a sense of peace and repose to this place that we gravitate towards. After a good nights sleep, we started out for the longest day of our plan. 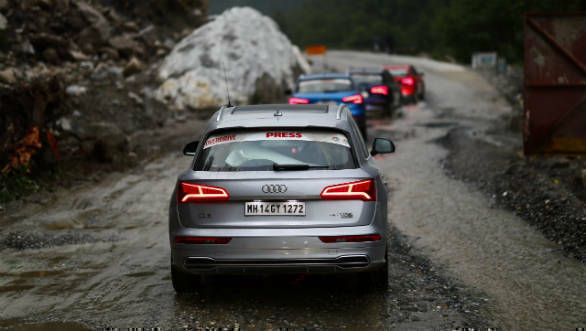 The Audis would cross the Baralachla, Nakeela, Lachungla as well as the Tanglangla to reach Leh by evening. Darcha, the first checkpost was silent as we crossed it at the break of dawn. As the amount of tarmac roads has increased in this region, you can cover ground quite fast in a car like the Audi Q3 or Q5. Their sporty-SUV bent seems to fit the terrain quite well. You do have to be careful though. The Himayalas are mercurial and young. The land under the tarmac shifts and it makes what looks like smooth road, a bouncy affair full of crests, dips and troughs. And of course, there are the famously broken stretches. Like the north side of Rohtang from the day before. Or the north side of Baralachla and the dusty-bumpy run to Pang. And of course, the danger of altitude sickness (Acute Mountain Sickness or AMS) always lurks in this region. The cars ascend as high as 17,000 feet or more but even the stretches in the valleys often stay as high as 14,000 feet. In fact, we had our own Red FM radio station courtesy RJ Abhishek whose chatter was falling prey to the headaches and nausea that marks the onset of AMS. To his credit, we did have some good laughs with him before he had to fly out as his condition worsened. Each room in the Grand Dragon has a warning about the symptoms that come with AMS and what to do to help yourself - stay hydrated, well fed and rest. But AMS is an unpredictable beast and the possible effects include HAPE and HACE, both can be fatal as your lungs fill up with water, or your brain swells up (respectively). It was a long drive but we were surprised at how good we were feeling when we finally reached Leh about an hour before sundown. They were streaked with the dust and watermarks of the multiple water crossings that make up the stunning but arduous road to Leh. But they were running well and everyone was in high spirits. Tomorrow, we'd compete to clean them up! So that we could head out and dirty them up again. This is the life.